What's included in my Log and Timber Frame Home Package?
. . . in my Log and Timber Frame Home Package? Handcrafted Log Walls with your choice of Log Species, Log Diameter and Corner Notch Style. A stacked log home features main floor walls which consist entirely of logs, stacked horizontally on top of each other. Structurally, timber frame is similar to the round log post and beam style, where the entire structure consists of posts and beams. However, visually it is quite different, as the natural irregularities of the log are removed when it is cut to a square shape. Log Walls pre-drilled and outlet boxes precut and flattened. Log Roof Beams which include depending on the roof design Ridge Beams, Purlins, Collar Beams, Valley Beams, Hip Beams, Rafters, etc. We offer a full design service to custom design your home based on sketches, notes and ideas or altering an existing plan you may have. Wall system for Posts and Beam or Timber Frame are posts and beams with conventional framing in between the post and beam structure. Timber sawn from the whole tree with the heart at the center. Typically, large dimension, and value-oriented timbers are box-heart. Checking can occur that may run to the length of the timber. What’s NOT Included in my package? 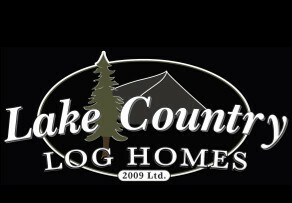 Lake Country Log Homes generally do not turn key homes. It is not cost effective nor in the best financial interest of our clients to do so. It is the client’s responsibility to acquire a local/general contractor for the overall construction of the home when it arrives. It is also the responsibility of the clients to select and hire the variety of trades engaged in getting a home to turn key ready.